More than 50 different kinds of fish swim in Fort Peck Reservoir, Montana's largest body of water. The lake is about 134 miles in length and has a maximum depth of 220 feet when full. There are over 1,520 miles of shoreline, longer than the California coast. The reservoir was created from 1933 through 1937 by constructing a 3.8 mile-long dam across the Missouri River. Some of the hotly pursued species include walleye (a priority among the serious anglers! ), northern pike, paddlefish, sauger, lake trout, small mouth bass and chinook salmon. A paved road for larger vehicles provides direct access to the reservoir at Fort Peck Marina, located near the west side of the dam. Other access roads are gravel and/or dirt, leading to Hell Creek Bay, 26 miles north of Jordan, and one on the south fork of Rock Creek Bay, about 10 miles west of Highway 24. All marinas include concrete boat ramps. Surrounding this large expanse of water is the Charles M. Russell (CMR) National Wildlife Refuge, managed by the US Fish and Wildlife Service, which provides over one million acres of public land for fishing, hiking, hunting, camping, bird-watching, and other outdoor recreation. Need to check the weather before accessing the reservoir's dirt roads as they can become impassable when wet. Fort Peck Reservoir is located on the Missouri River, 18 miles southeast of Glasgow. The lake is 134 miles long at normal operating level, with 1,520 miles of shoreline. You can reach Fort Peck Reservoir from the west by turning off of US Highway 191 northwest of Lewistown at the Fred Robinson Bridge. From the south, the reservoir can be reached from Montana Highway 200 at Jordan and then north via the county road. 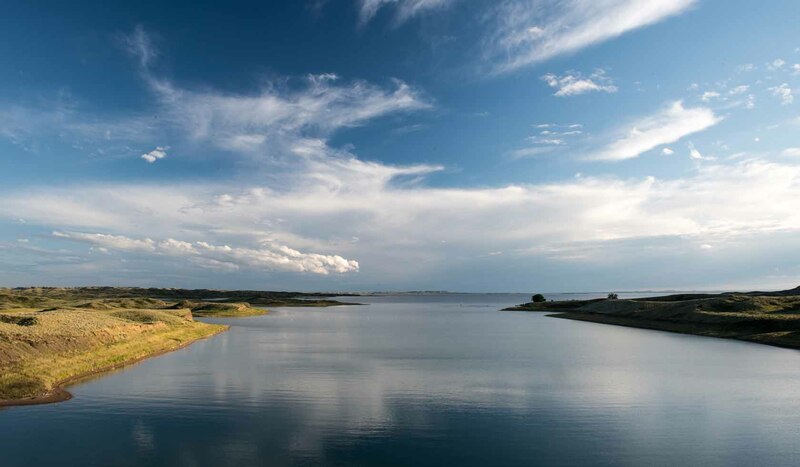 The eastern edge of the reservoir is accessible from Montana Highway 24, which parallels the entire length of the Big Dry Arm and passes through the town of Fort Peck and over the dam. The north side of the reservoir is the least accessible from main roads. US Highway 2 between Glasgow and Malta is the closest paved road. There are numerous county roads that take off south from Highway 2 and wind their way toward the reservoir.Fort Peck Reservoir is located on the Missouri River, 18 miles southeast of Glasgow. The lake is 134 miles long at normal operating level, with 1,520 miles of shoreline.